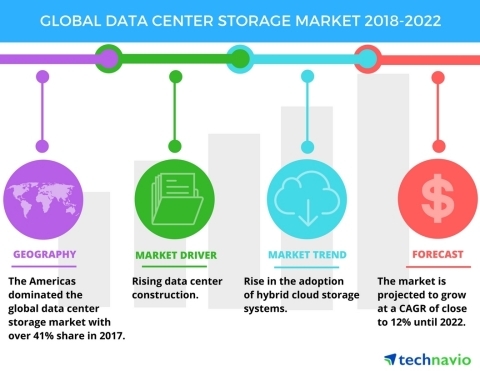 Technavio has published a new market research report on the global data center storage market from 2018-2022. LONDON--(BUSINESS WIRE)--Technavio market research analysts forecast the global data center storage market to grow at a CAGR close to 12% during the period 2018-2022, according to their latest report. This market research report segments the global data center storage market into the following storage systems, including SAN system, NAS system, and DAS system and key regions, including the Americas, APAC, and EMEA. Technologies such as cloud computing and big data analytics stresses on the construction of more data center facilities worldwide. The advent of social media and the IoT has increased the requirements for data centers to store and process information accurately with fast retrieval times. Data centers comprise of infrastructure such as storage and servers, along with networks that connect the physical infrastructure and web-based interfaces. To develop such facilities and to provide users with access to more scalable, reliable, and efficient storage solutions, enterprises are looking for modern design techniques to facilitate such developments. Many companies have adopted cloud storage to store their data. The demand also led to an increase in adoption of storage infrastructure such as flash and hybrid arrays. The Americas was the leading region for the global data center storage market in 2017, accounting for a market share of 41%. By 2022, APAC is expected to witness the highest growth rate of nearly 4%, whereas the Americas and EMEA are expected to see a decline in their respective market share. Technavio market research analysts forecast the global data center storage market to grow at a CAGR close to 12% during the period 2018-2022.